You can move to any part of India and you are sure to find the magnificent floor art-Rangoli in almost every house. 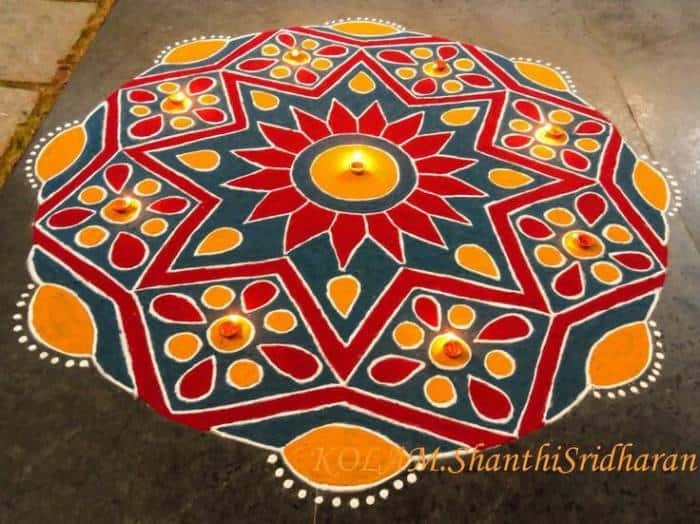 On every occasion, whether it’s the start of any new project, religious ceremonies or festivals it has to be welcomed with a beautiful Rangoli on the floor. Even in workplaces Rangoli is finding its way. 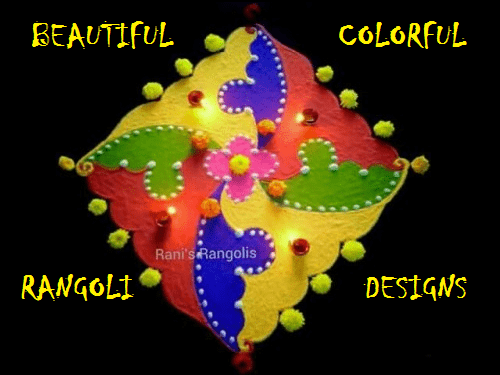 As the word Rangoli itself means the beautiful arrangement of colors. 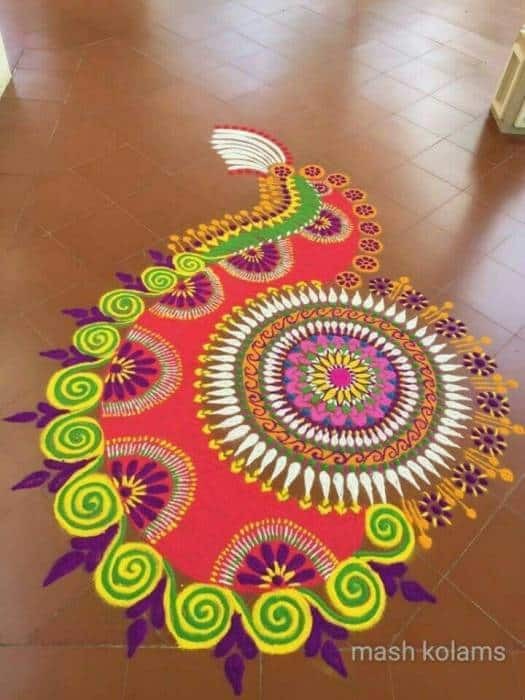 For people who are searching for some New Rangoli Designs to decorate their floor this is the right post to look at. 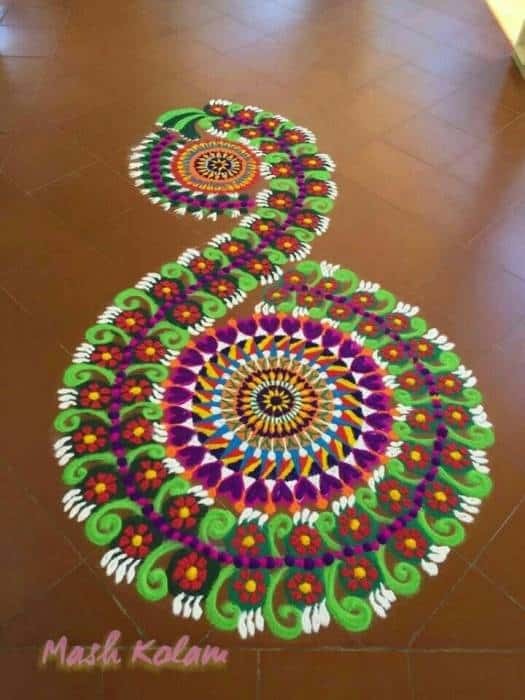 Here we have come up with a list of 30 innovative New Rangoli Designs that will make your floor lively. 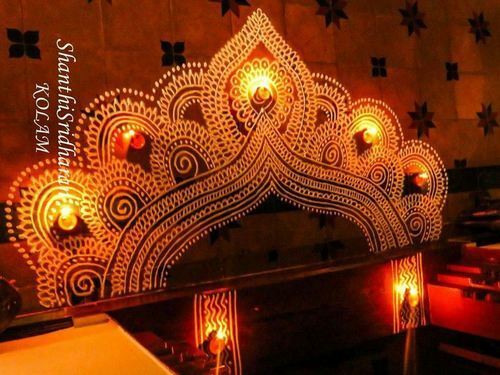 1: Welcome Rangoli designs are great designs for welcoming your guests in a creative way. You can easily create it by making a circular chain and writing letters on it. You can also write some cute little messages in your Rangoli design according to the occasion. 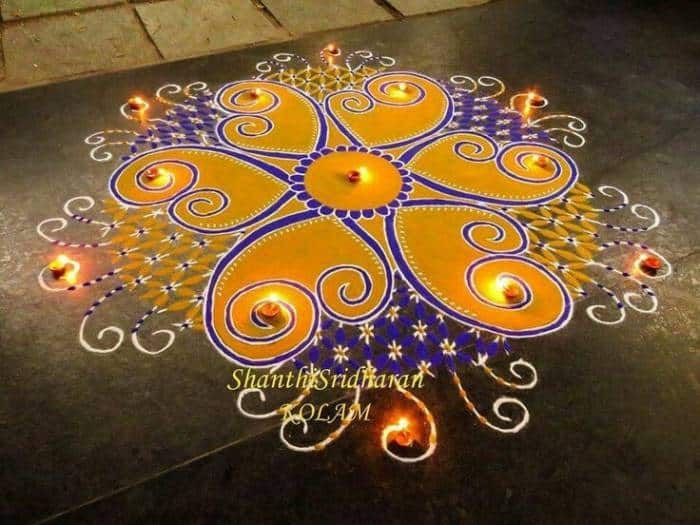 2: Beautiful Rangoli design of colorful flower created by simple geometric shapes. By adding borders to the flowers you can beautify your floor art. Vibrant royal blue with feminine pink always looks great together. This color combination will always enhance the beauty of your design. 3: Violet and yellow makes a great contrast and you can use them to create a beautiful New Rangoli Designs. Together these colors look so traditional that one can’t afford to miss them in their color palette. 4: Peacock designs are very popular and they look very colorful and stylish. You can sharp your creativity skills by adding some style to your peacock design. 5: This simple and quick free hand design is a great idea for people who are running short with time. 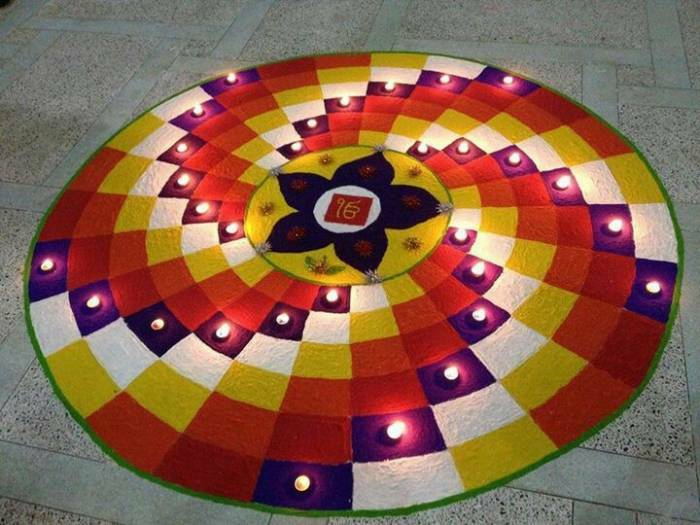 Instead of going for one huge Rangoli design, you can make many short Rangoli designs like this in your floor. 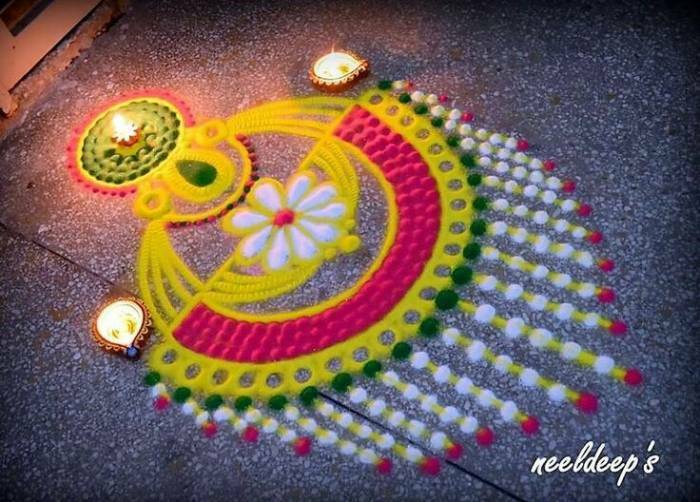 6: This unique New Rangoli Design of Lord Shiva is so enchanting. 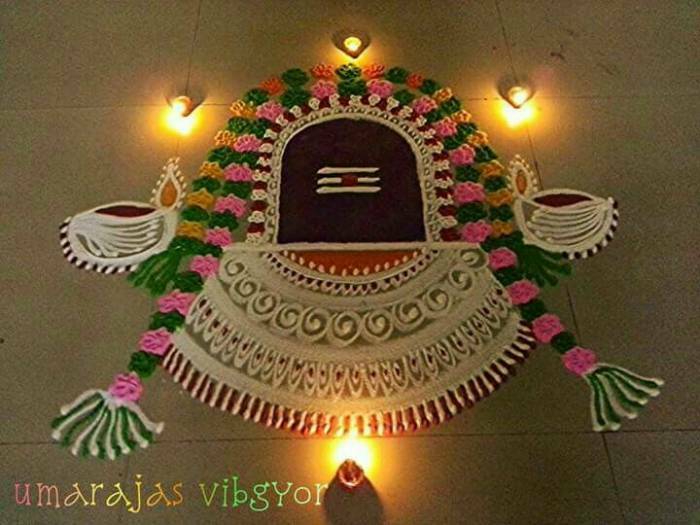 While making Rangoli designs of any God you need to pick the place very cautiously. One should look for a corner area, mostly in the Pooja room. 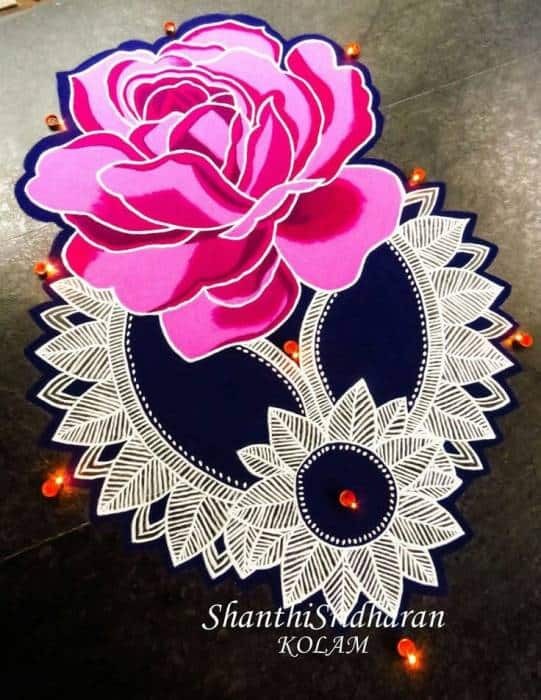 7: If you are looking for some decorative piece of Rangoli design, then you can try this rose design. Use two shades of pink color, one in dark shade and other in lighter shade. 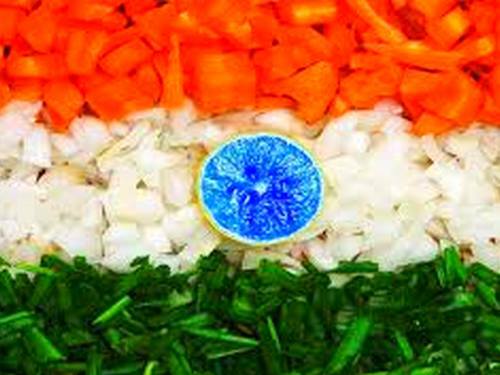 This is a sort of modern Rangoli art where different color hues are used to give the Rangoli a 3D effect. 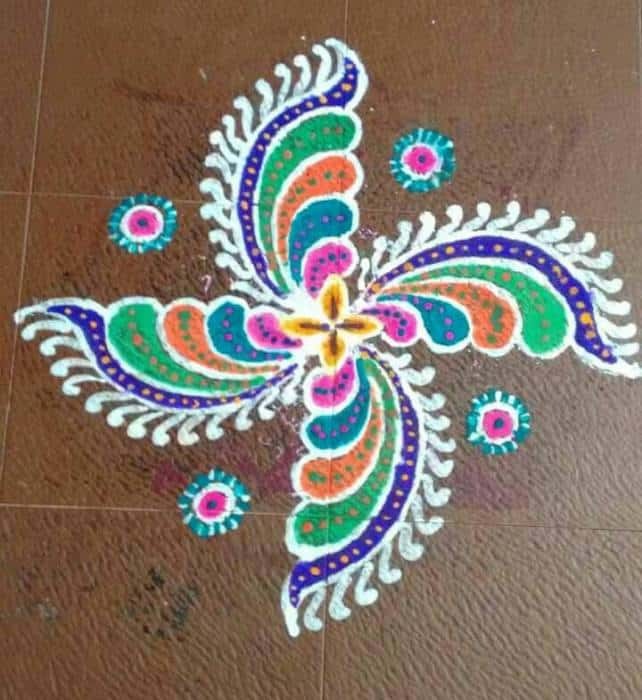 8: If you are expert in making Rangoli then you can try your hands on it. It will take some of your time, but the end results are worth it. 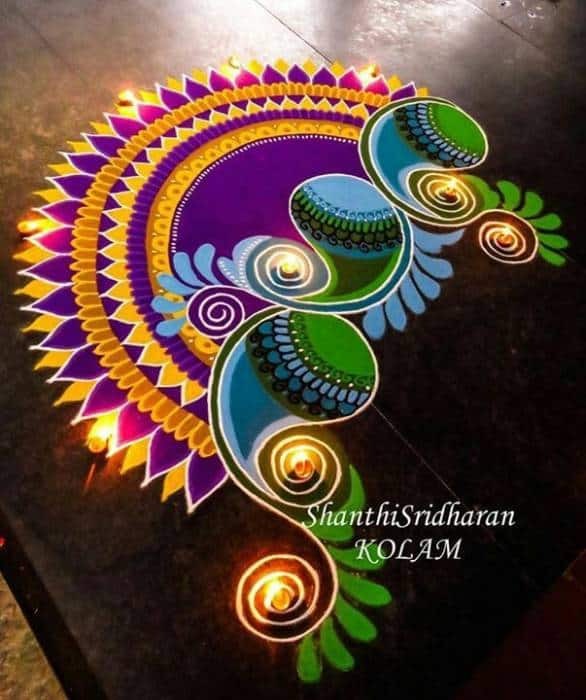 This is a fine Rangoli design where you can’t mess with the colors. 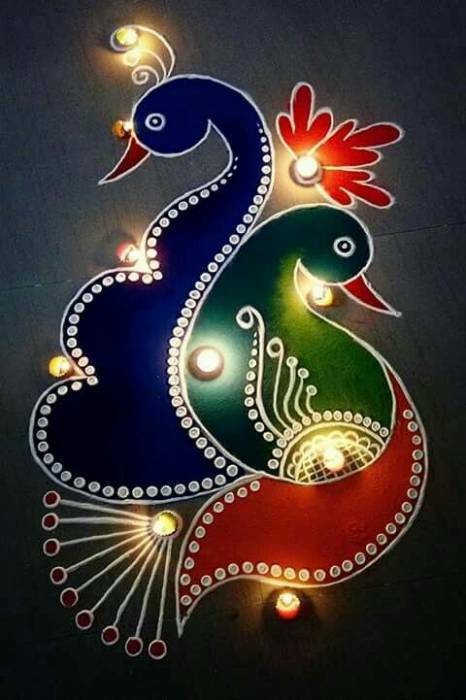 9: Another beautiful peacock design to add charm and beauty to your floor. 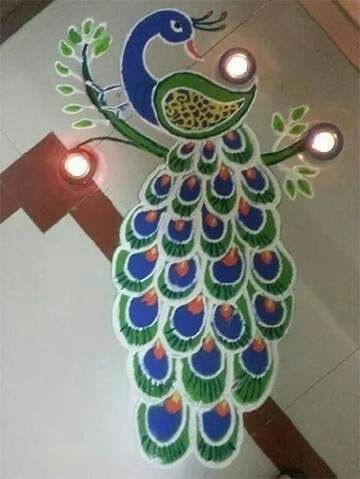 Here the Rangoli artist has tried to create the true picture of the beauty of a peacock sitting on the branch of trees. 10: This simple decorative design of a pair of peacock is a great piece of art for beginners. 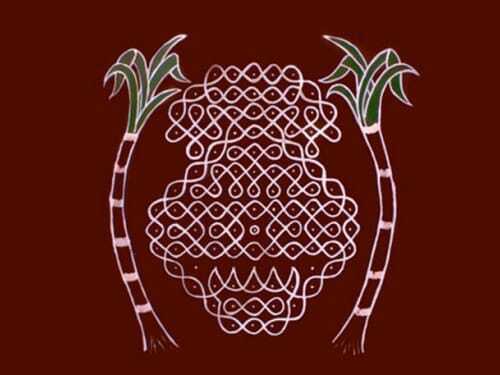 What makes people attracted to this design is its sheer elegance. 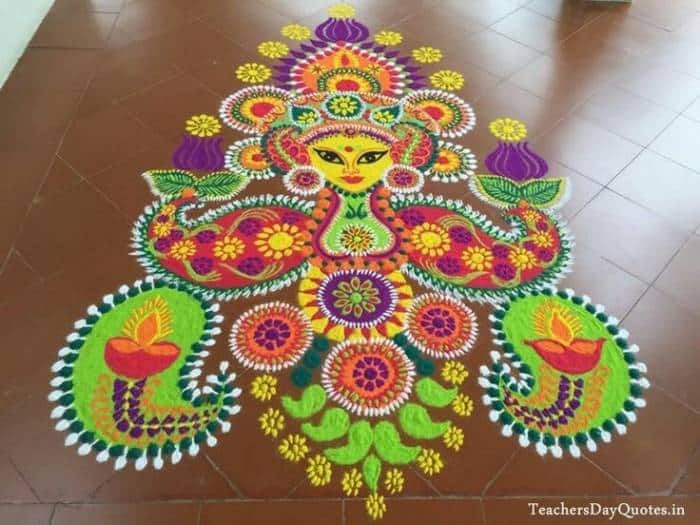 11: If you are looking for some unique New Rangoli Designs for the coming Navaratri festival, then this is what you may be looking for. If you are a devotee of goddess Durga then you can’t miss this. 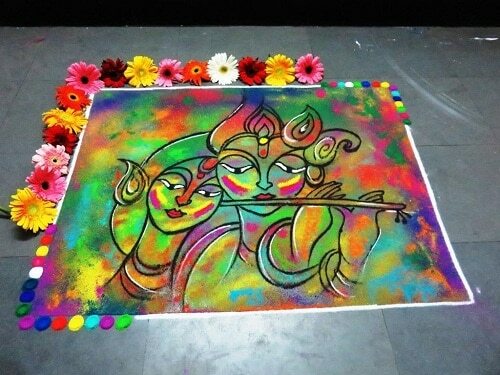 12: If you love modern art, then this fresh Rangoli design can impress you. A beautiful portrait of girl using contemporary art style. 13: This easy Rangoli design is a great visual treat and can be drawn very quickly. This design shows the two faces of geometry i.e. simple and complex. A complex looking structure, but if you know the hint then it becomes quite simple. 14: Kalash plays an important role in Hindu rituals and so this design is one of the great idea to make during religious ceremonies. 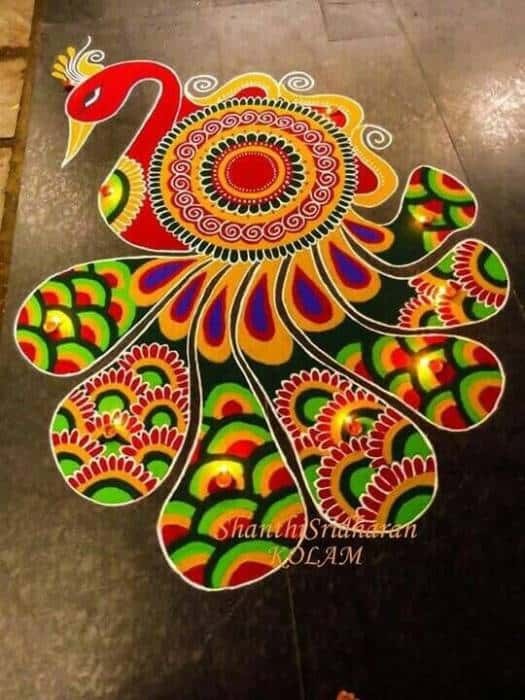 The Kalash is itself quite colorful and attractive object and when it is paired with another beautiful Rangoli then the whole concept becomes so mesmerizing. 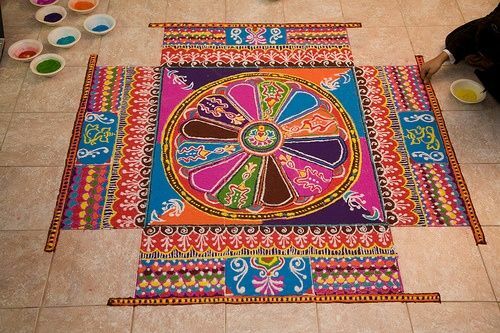 15: This free hand Rangoli art is a great one for decorating the center of the hall. 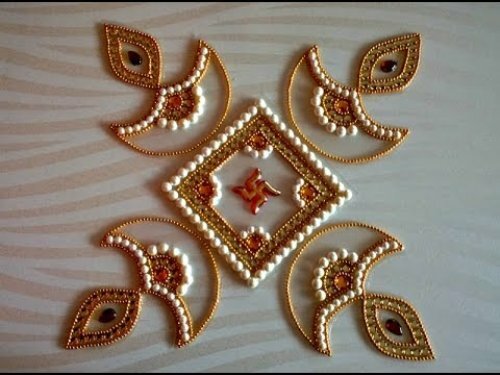 These New Rangoli Designs can be quickly drawn without any other support. 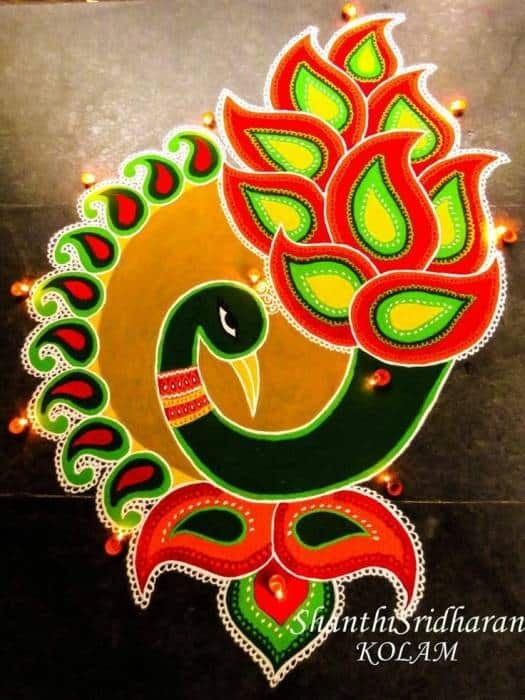 16: If you are looking for some traditional art, then this beautiful peacock Rangoli design with a musical instrument is surely going to steal your heart. This art gives us a flashback of rich Indian culture and music. 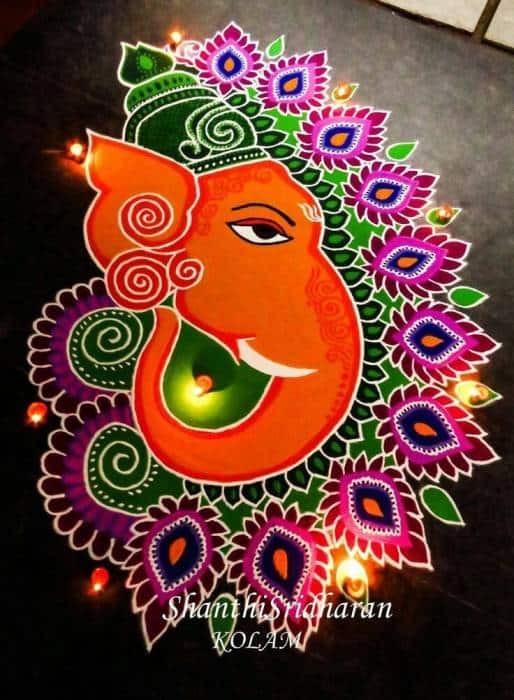 17: Lord Ganesha is being remembered before starting any new work and this quick Rangoli art is a great one for beginners. Remembering the God in a most creative way. 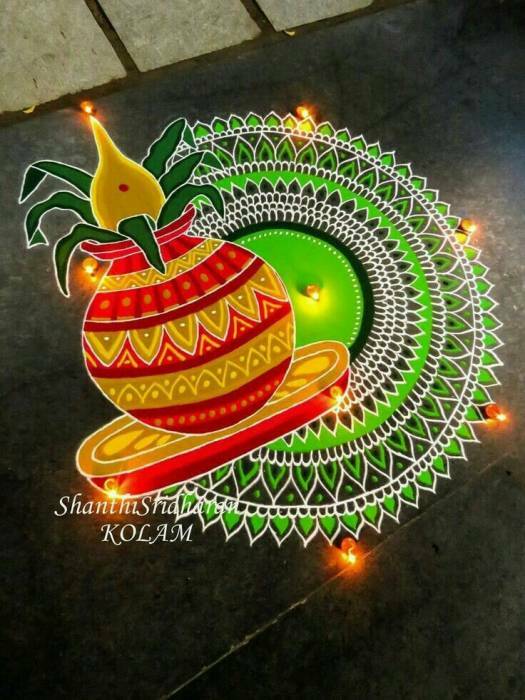 18: Great mix of traditional kolam design with modern rangoli art. 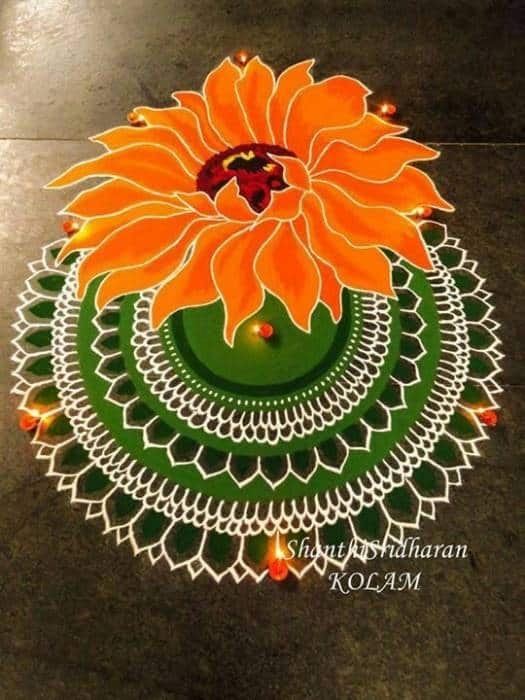 Beautiful sunflower design paired with a traditional kolam design. 19: A simple flower can be used to create such a beautiful floral design. To make this style you will need basic colors. 20: If you are looking for a masterpiece then this one is for you. From colors to its design everything is so refined. 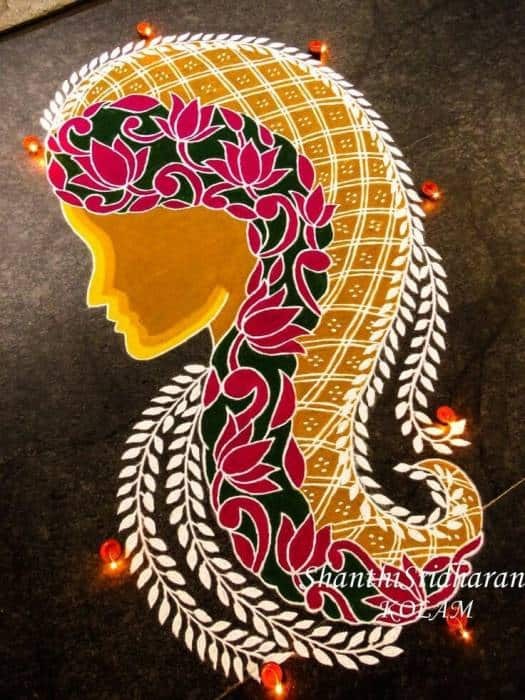 This Diwali Rangoli design is a beautiful piece of art which can make your Diwali night more colorful. 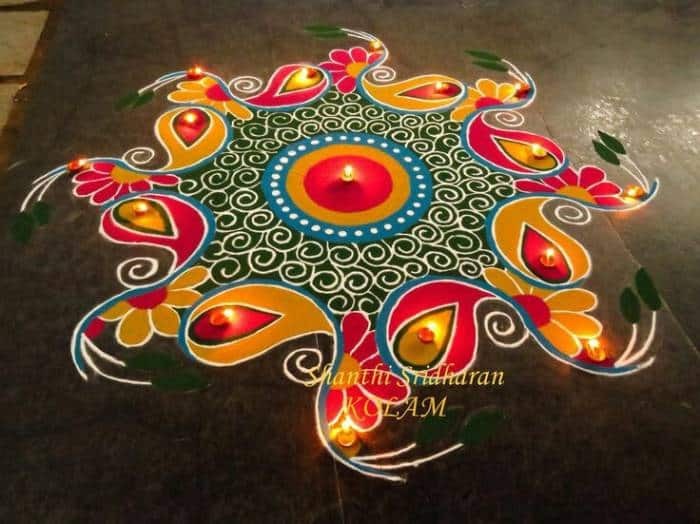 21: You can illuminate your floor by drawing this vibrant Rangoli design. It looks like a beautiful wall hanging. 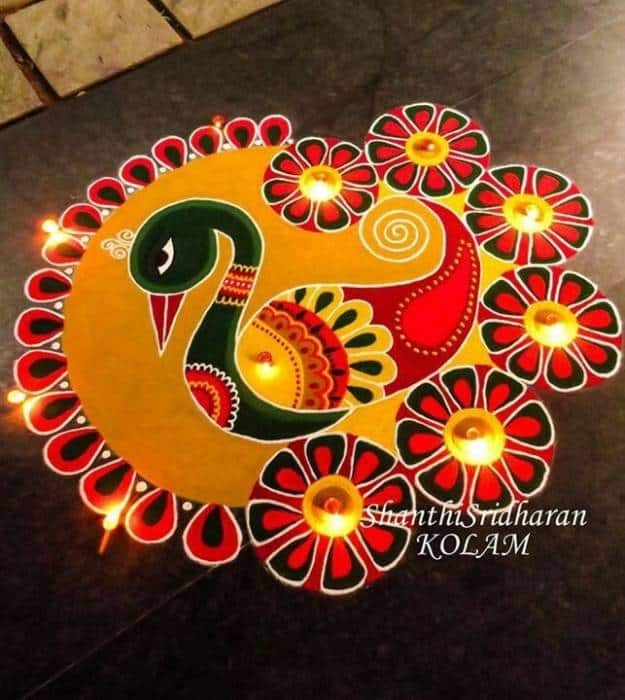 This colorful design is a classic example of easy unique Rangoli using simple tools. 22: Lord Ganesha design beautifully decorated with colors. Flowers Canberra used to make beautiful borders. 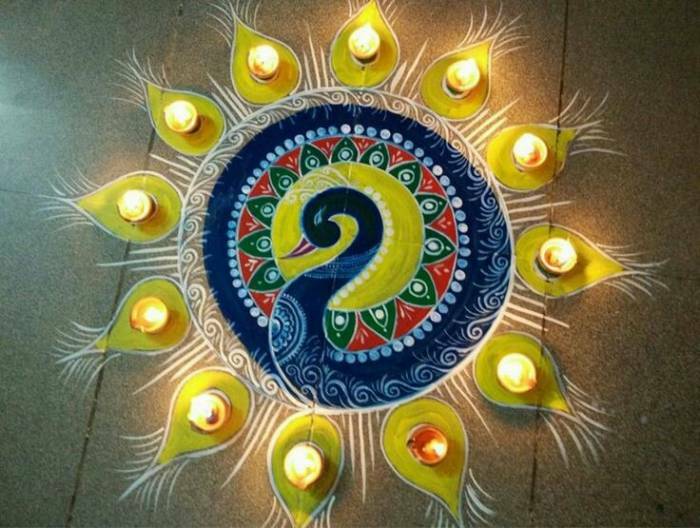 23: Mesmerizing peacock design using indigo blue and yellow to create the magic on the floor. 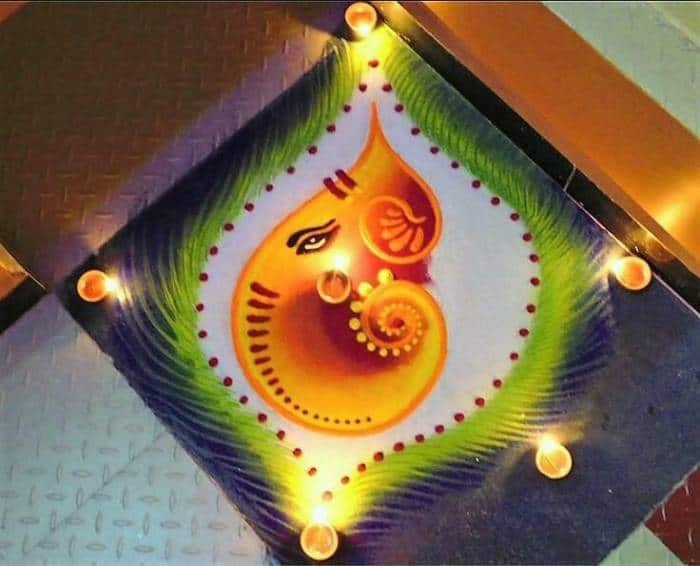 24: Beautiful Ganesha design with a creative frame using innovative techniques of making Rangoli. 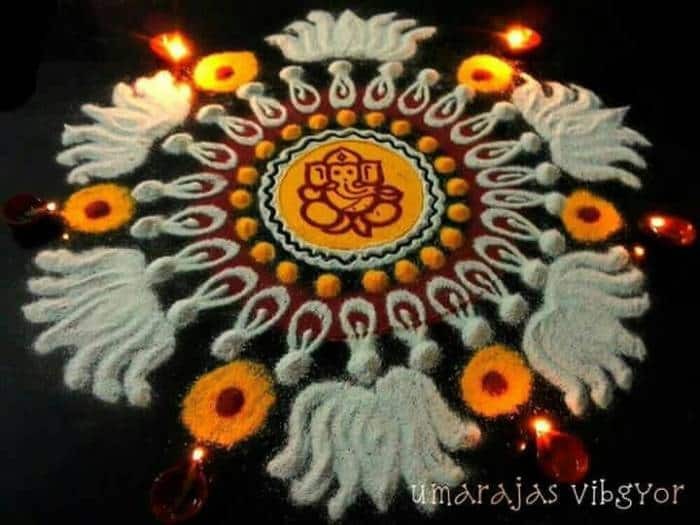 A classic example of how Rice powder can be used to create a simple and special Rangoli. 25: This design will look great on light colored floors. 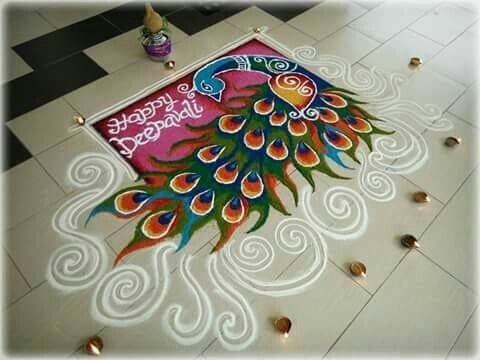 26: Classic design and one needs to be an expert in Rangoli making before trying hands on it. 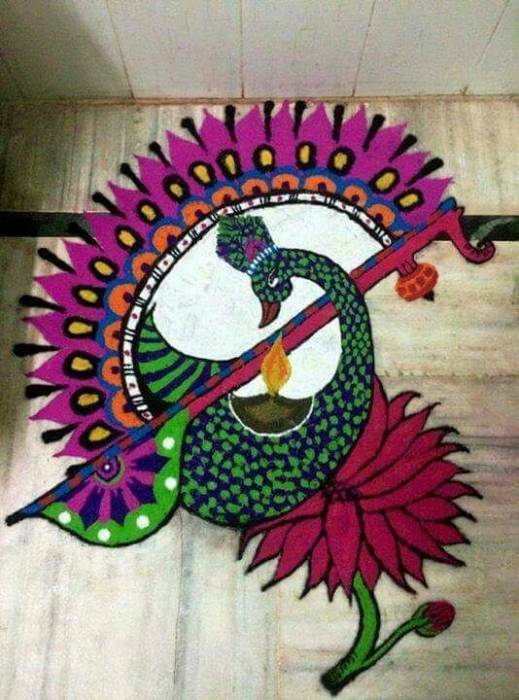 27: Colorful New Rangoli Designs to welcome festivals of light, and what can be more beautiful than this colorful peacock. 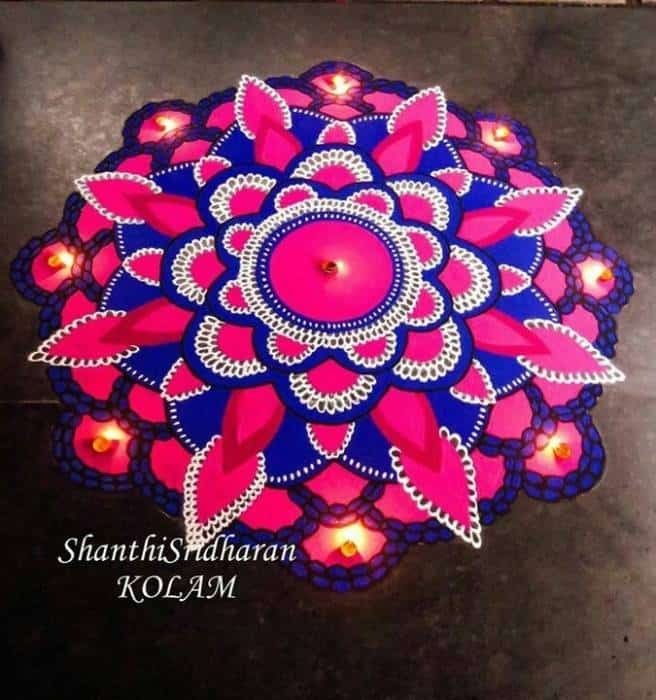 28: Colorful Kolam design using basic geometric shape. Smart use of red and gray color to create an oomph factor. 29: Enchanting design of peacock a must try for this festive season. 30: While selecting colors one must keep in mind the color of the floor. 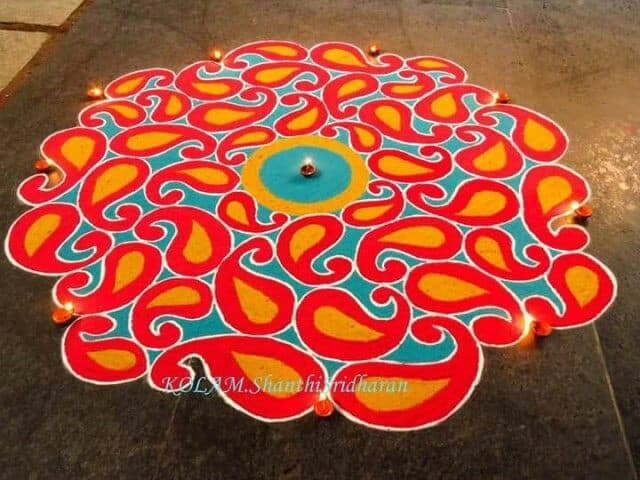 If you have a dark colored floor, then look for florescent colors and if you have a light colored floor then use bold colors to fill your Rangoli. Let us know which one of these New Rangoli Designs is your favorite. 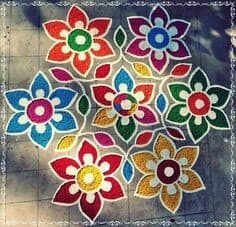 Also check these beautiful Flower Rangoli Designs.